As the Scottish Smallpipes plays one continous sound the only way that notes that are the same can be played next t o each other is by using grace notes. 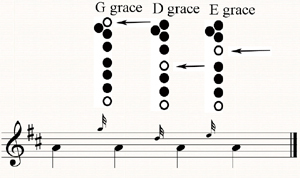 Chapter 5 explains the first grace notes. Have a listen to the audio lesson and watch the movies.